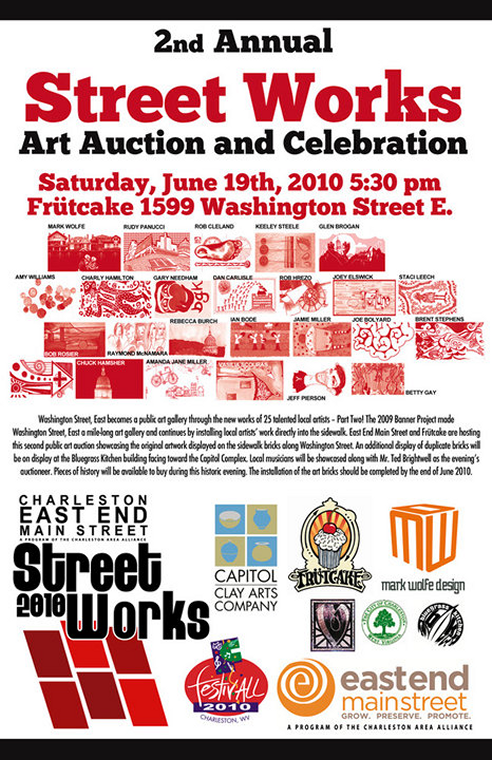 This Saturday, the original artwork for the 2010 East End Main Street Streetworks project will be auctioned off at Frutcake, on Washington Street. The auction starts at 5:30 PM, with Ted Brightwell serving as auctioneer and MC for the evening. This is one of the visual art tie-ins with FestivAll. 25 artists contributed designs which were transferred to bricks that will be permanently installed on Charleston’s historic East End. This is a continuation of the Streetworks art project that began last year with the colorful banners you see in that part of the city. This year, the focus turned to bricks, and I was honored to be invited to participate. The assignment was simple: I had to create a design that captured the spirit of what Charleston’s East End means to me. This design had to be something that would translate to a four by eight inch brick, using a process inspired by my friend, Eric Pardue, and perfected by Mark Wolfe with Mike and Karen Garnes of Capitol Clay Arts. Today, I’m going to walk you through the process I used to create my design. With such a small area to work with on the brick, I knew my design couldn’t be cluttered. Also, since the finished brick would be a monochrome design, it was right in line with a project I was knee-deep in when the invite came–“Stark Charleston,” my animated short for RFC 100 which I have since decided to expand to feature length. 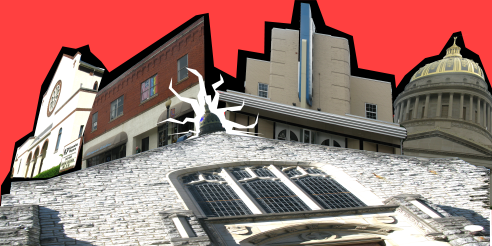 “Stark Charleston” focuses mainly on the architecture of our city, and I had tons of photos on hand, just waiting to be digitally manipulated, composited and assaulted. I chose a few key images, which represented the East End to me. 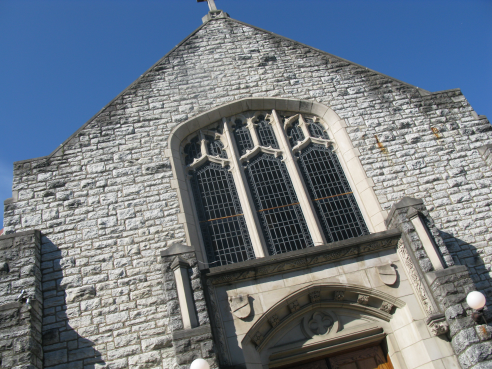 For the base, I chose a shot of St. Paul’s Lutheran Church. This is what the original looked like. I wanted to see how this would look with the “Stark Charleston” filters applied, so I could decide if this was suitable for the final brick design. I was very pleased with the look (seen at right), and returned to the original picture for further digital mayhem. 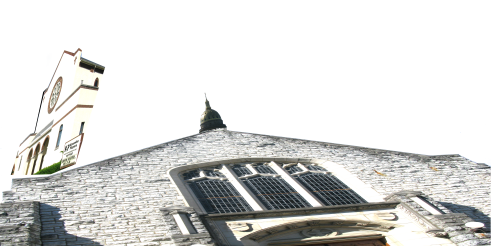 I had a great oddly-angled photo, and decided that I would stretch it to fit the aspect ratio of my brick design. and form the base, atop which other images would rest. 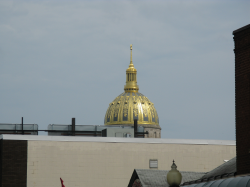 Since this photo cuts off the cross at the top, after applying the digital squoosh filter, I replaced the missing cross with the dome of our State Capitol Building. This was mainly because I thought it would look cool. I had several shots of the dome, and chose one taken at a distance, where the dome just seems to hover over the horizon of other structures. This was the central image of the piece. 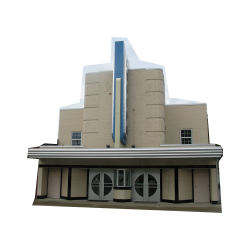 An early version of this also composited the front of the Kanawha Players Theater in place as one of the four other buildings chosen for the final design. 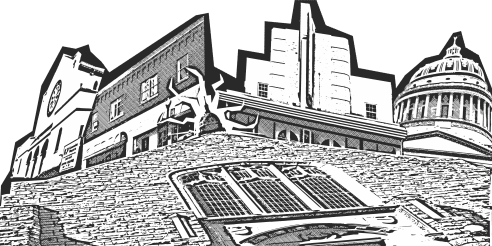 The other buildings rising over my surrealistic landscape include The Bluegrass Kitchen, a cultural vortex where all the cool kids congregate. Aside from being one of the best places in town to grab a meal, The Kitchen also occupies a primo piece of real estate, within sight of both The State Capitol and The Empty Glass. The Empty Glass didn’t make the cut for the final design because I didn’t manage to get any decent shots of it. There are State offices currently housed in what was once The State Theater (I think). This beautiful Art Deco building front has been preserved, despite the soul-crushing work that state-employed drones are forced to do within its walls these days. It’s Deco, so it had to go into the final design. I had space for one more building, and I decided to repeat myself a bit. The Capitol Dome is so distinctive, and it’s so visible from many points all over The East End, so I took a different shot of the Capitol Dome, and had at it with a variety of distortion filters until it looked somewhat unkempt and lumpy–a look not uncommon on the East End. 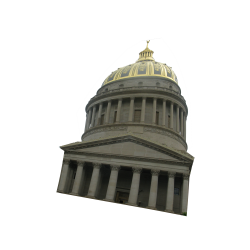 The distortion kept the image from being a simple visual echo of the centerpiece, but still presented a more detailed look at Cass Gilbert’s majestic dome. With the elements chosen, I had to try a few different layouts, so they’d blend together well. Here’s the composite shot of background elements. Once I laid the other image over top of this, I had much of my design in place. 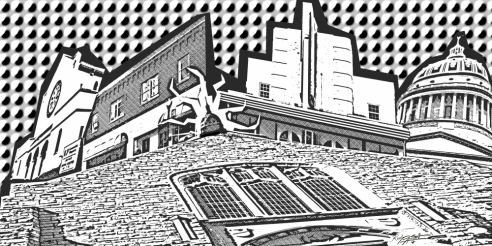 I’d added a thick black line around the various elements, and surrounded the central dome with a bit of Kirby Krackle to make it stand out from the buildings behind it. The red was simply a temporary color for compositing purposes. 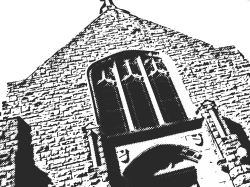 I then ran the image through the “Stark Charleston” filters. This blew out the red background and gave me an almost-finished piece. I still wanted to do something to fill up the stark white background. 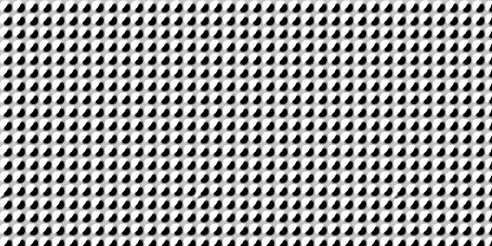 So I generated a crude large-dot pattern. I knew this would look good on the finished brick, and it wouldn’t detract from the textures used in the rest of the design. There you have it. Soon this image will be installed in the sidewalk on the East End, so you can crawl on your hands and knees and pretend you’re at an art gallery. Also, people might spit gum on it, which is technically a form of art criticism. There is an additional amusing story about this piece. I was apparently one of the first artists to turn in my design. Since I work digitally, I also had to have my work printed. I chose to have it printed on aluminum, since I’ve done that in the past, and it gives me a finished work that doesn’t really need any additional framing–it’s basically a big artsy-fartsy road sign. What I didn’t know was that, after I had my piece printed, the artists were asked to keep their finished pieces rather small—no more than ten by eighteen inches. So my piece might be a tad bigger than everyone else’s at the auction. Maybe you could say more than a tad. The term “visible from space” has been bandied about. If you go to the auction–which I highly recommend you do since there’ll be food, fun, booze and darned good times in exchange for your twenty-dollar admission–my piece will be the gigantic metal thing that looks like a garage door. You can bid on all the art, but mine is the only one that can be used as roofing. It has been an honor to be invited to contribute to this project. It even landed me on the cover of the Charleston Daily Mail and I could also be seen lurking in the background of a piece on WSAZ TV. You should definitely make the Streetworks auction one of your FestivAll stops this Saturday. One last look at the PR: Last year: Banners. This year: Bricks. The celebration of Washington Street becoming a public art gallery through the works of 25 talented local artists….PART TWO! The project that started in 2009 that made Washington Street, East a mile-long art gallery is continuing the effort by installing local artists’ work directly into the sidewalk. 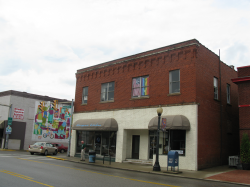 East End Main Street and Frütcake are hosting the second public art auction solely showcasing the work displayed on the sidewalk bricks along Washington Street. 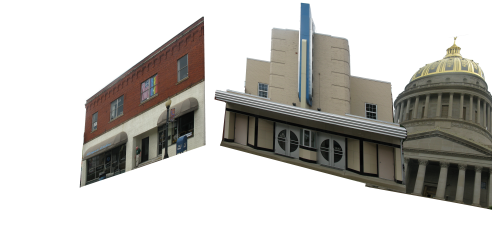 Each image, based on the locally designed original pieces up for auction, will be transferred to clay bricks using a firing and glazing process provided by Capitol Clay Arts Company and installed permanately along Washington Street. Local musical talent will be showcased inside along with none other than Mr. Ted Brightwell as the evening’s auctioneer. Don’t miss your chance to bid on a piece of East End history and have a great time with Charleston locals and friends! EEMS will split all proceeds with each artist 50/50. All proceeds that goes to EEMS will be used for future business district revitalization efforts such as public art, facade renovation, business recruitment, and much more! You know what would be insane to do with my little webcast? It would be crazy for me to try and cover FestivAll in a timely manner with RFC. So I’m going to try it. Look for three unconventional episodes of Radio Free Charleston in the next ten days. All three of the shows will originate from FestivAll, and they’ll be quite a bit different than our usual music and animation extravaganzas. Each show will be a cinema-verite travelogue of our fair ciy at its best, and each show will include a 120 second (or more) Art Show. The first of our FestivAll specials will be posted Monday or Tuesday, and it’ll feature footage from Buswater, LiveMix Studio, The Art Parade, Art on a Stick, the Streetworks Auction and more. Our second FestivAll episode will be part of of The PopCulteer next Friday. The third FestivAll episode of RFC with music from The VooDoo Katz and Comparsa will go live a day or two after FestivAll wraps up. This is what happens when the hotbed of opportunity meets the wild hair of inspiration. There will be tons of FestivAll coverage. Sunday Evening Videos, Monday Morning Art and photo essays all week long will be devoted to Charleston’s big artsy shindig.